We have an expression in English to describe someone who gets lost in details. We often say that such a person "can't see the forest for the trees." Now lots of cultures have similar expressions; so it isn't hard to understand what we mean when we say this. When we are surrounded by lots of details, it's easy to become lost in minutia to the point that we become confused about larger, more important issues. So, in confusing situations, we often remind each other to step back and look at the big picture. For most people, one place where details tend to obscure the big picture is the Old Testament. The Old Testament is a very large book, containing so many names, places, events, theological teachings and moral instructions that we easily lose sight of the underlying perspectives that unify the Old Testament. Now, to overcome this confusing and sometimes bewildering experience, we need to step back and grasp the big picture of the entire Old Testament. This is the second lesson in our Old Testament survey entitled, Kingdom, Covenants and Canon of the Old Testament . As we will see in this series, the Old Testament is a book about the kingdom of God, which is administered by divine covenants, which in turn are explained and applied to specific situations through the books of the Old Testament canon. This lesson is entitled, "The Kingdom of God," and in this lesson we will see that a proper understanding of the Bible's theology of the kingdom or reign of God provides one of the most comprehensive and unifying outlooks we can have on the Old Testament. 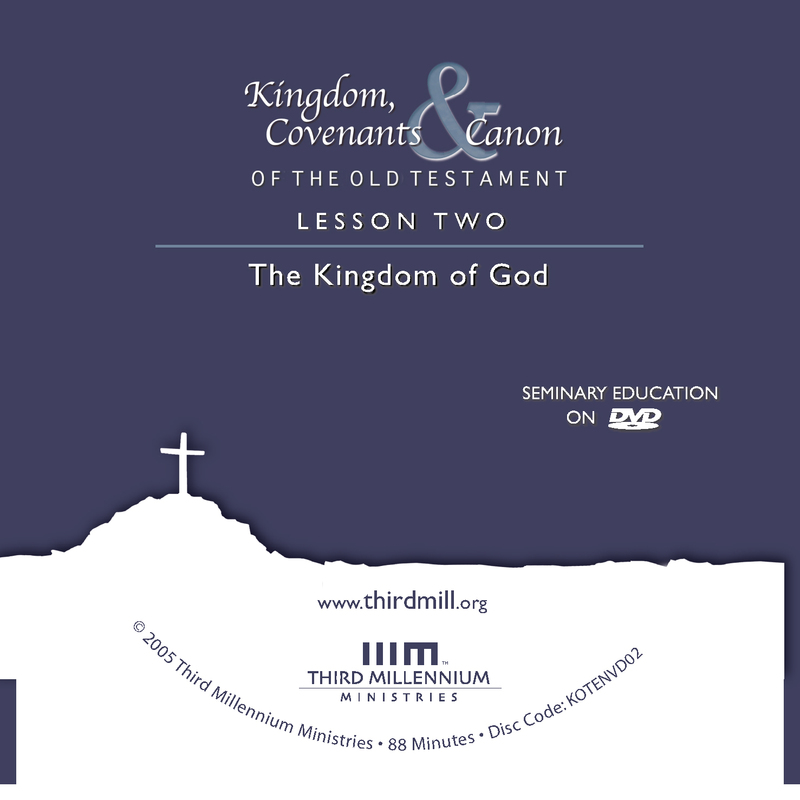 In this lesson, we will explore four dimensions of the biblical teaching on the kingdom of God. First, we will see how the Scriptures speak of the kingdom of God in both broad and narrow senses. Second, we will look at the kingdom of God during the primeval period, the earliest stages of earth's history. Third, we will explore God's kingdom in the national history of Old Testament Israel. And fourth, we will see how the kingdom of God appears in the New Testament. By looking at these four topics, we will gain a broad and coherent perspective on the entire Old Testament. Let's look first at the way the Old Testament speaks of God's reign in both broad and narrow senses. As we begin our lesson it will help to explain two outlooks that are absolutely essential to a proper understanding of God's kingdom. First, we will see that, in a broad sense, the Old Testament teaches that God's sovereignty is complete and unchanging. And second, we will see that, in a narrow sense, God's kingdom is developing and growing throughout history. Let's consider first the more general outlook on the unchanging absolute sovereignty of God. The Lord reigns, he is robed in majesty… and is armed with strength. The world is firmly established; it cannot be moved. Your throne was established long ago; you are from all eternity (Psalm 93:1-2). In this respect, the faith of Old Testament Israel differed greatly from the religions of its neighbors. Neighboring religions commonly taught that many gods competed for sovereignty, and that the power of these gods ebbed and flowed according to historical circumstances. In some cases, gods rose and fell according to the cycles of the seasons of the year. In other cases, gods rose and fell as their favored nations experienced victories and defeats in war. But such concepts were not part of biblical faith. Yahweh, the God of Israel, was the sole Creator, Sustainer and Ruler of the entire creation, even of heavenly creatures or so-called gods. In this sense, the sovereign kingship of God is unchanging. All of creation has always been and always will be his kingdom. Now, as important as it is to believe that, in a general sense, God has always ruled over all creation, we must also recognize a second, narrower sense in which the Bible speaks of God's kingdom as developing. on earth as it is in heaven (Matthew 6:9-10). Now since we know that in a more general sense God has always ruled over all creation, including all of the earth, these words should give us pause. What did Jesus mean when he taught us to pray, "your kingdom come"? How can something that is already here "come"? Well, in a word, Jesus referred to the Old Testament teaching that God has a developing historical kingship. He taught that the kingdom of God comes to earth and transforms it, so that the earth mirrors heaven. Notice again how Jesus put it in Matthew 6:9-10. Using the custom of ancient Hebrew poetry, Jesus' words about the kingdom consist of three parallel lines. In the first place, he asked for God's name to be kept holy. In an elaboration on this, he explained that God's name would be kept holy when the kingdom came. And then to explain what he meant by the coming of the kingdom, Jesus added that the coming of the kingdom would be God's will being done on earth as it is done in heaven. Jesus taught us to pray that God would bring his kingdom to earth to such an extent that the earth would become like heaven, so that God's name would always be kept holy everywhere. Now Jesus knew that God already controlled the entire earth, but he also knew that the Old Testament promised that God would one day redeem, renew and perfect the earth so that it reflected the wonder of heaven. And it was in this sense that Jesus asked for the kingdom of God to come to earth in his day. As far as Jesus was concerned, something was supposed to happen on and to the earth. God was supposed to extend his heavenly reign so that his will would be done here as there. As I looked, thrones were set in place, and the Ancient of Days took his seat. His clothing was as white as snow; the hair of his head was white like wool. His throne was flaming with fire, and its wheels were all ablaze. A river of fire was flowing, coming out from before him. Thousands upon thousands attended him; ten thousand times ten thousand stood before him (Daniel 7:9-10). This portrait of heaven is not unusual. It is the kind of scene that we find every time the Scriptures speak of God's heavenly throne room. But there are at least two dimensions of this picture of God's celestial reign that we should point out. On the one hand, as God reigns in heaven he reveals himself to his creatures in his special glorious presence. As the Scriptures teach, God is omnipresent; he is everywhere — but in his omnipresence he is invisible. In the throne room of heaven, however, God sits on his throne, wearing radiant white garments, with hair white as wool. His throne is ablaze with fire and consuming fire flows from his throne. God's special presence in his throne room is overwhelming; he appears as all-glorious; his blinding splendor fills heaven. Now compare the glory of God in the heavenly throne room with the glory of God on earth. At best, what we see on earth is a faint reflection of his overwhelming celestial splendor. Yes, we see God's glory reflected in the wonders of creation, but this is nothing compared to the glory of God in heaven. So, when Jesus prayed for God's reign to come to earth as it is in heaven, one aspect of what he had in mind was that the overwhelming brilliance of God's special presence would fill the earth as it fills heaven. The city does not need the sun or the moon to shine on it, for the glory of God gives it light, and the Lamb is its lamp (Revelation 21:23). So, when Jesus taught us to pray for the kingdom of God to be manifested on earth as it is in heaven, part of what he meant was that we should ask God to come to the earth in his glorious, royal splendor. Thousands upon thousands attended him; ten thousand times ten thousand stood before him (Daniel 7:10). Countless creatures before the throne of God attend him, worship him, and humbly do his bidding. At the name of Jesus every knee should bow, in heaven and on earth and under the earth (Philippians 2:10). So we see that Jesus presented the kingdom of God as a developing, historical, earthly reality. He longed for the day when God's glory would be so evident in his special presence on earth that God's will would be done as extensively on earth as it is in heaven. And he taught us to share that vision of the future with him. Now that we have distinguished the reign of God in a broad sense and in a narrow sense, we are in a position to see how the Old Testament finds its unity in tracing the development of the kingdom of God on earth. At this point, we will look at the kingdom of God in Genesis 1:1–11:9 which is often referred to as the primeval history. As we investigate the primeval history, we will look at three issues: first, how this part of the Bible defines the place of God's kingdom on earth; second, how it identifies the people of God's kingdom; and third, how it describes the early progress of God's earthly kingdom. Let's look first at how the primeval history establishes the place of God's kingdom. The opening chapters of Genesis explain how God first began to establish the earth as the location of his kingdom. We will look at how this geographical dimension of God's glorious reign is revealed in two steps. First, we will see that from the beginning God prepared the earth for his coming reign. And second, we will see how God planned to begin his reign in a central location, and then to expand its geographical boundaries to include the entire world. Let's begin by looking at the ways God initially prepared the world for the building of his kingdom. After this title, Genesis 1:2–2:3 shows that God immediately began forming the earth into a place for his glorious reign in a threefold structure. Two important things are said in this verse. On the one side, the earth was "formless and empty," covered with darkness and a chaotic deep. At this point, the earth was not a pleasant place to be; it was not ideal. The terms "formless and empty" are used elsewhere in the Old Testament to refer to wild and desert places on the earth, places that are uninhabitable by human beings. And in addition to this, "darkness" and "the deep," have very negative connotations throughout the Scriptures. At the very beginning, the earth was hostile and devoid of life. But on the other hand, verse 2 also tells us another essential fact about the opening of earth's history: "the Spirit of God was hovering over the waters." The God of light and life was not satisfied to leave the earth in its initial chaotic condition. He was ready to move against the dark, lifeless creation. The second part of the creation account, is the six days of ordering in Genesis 1:3-31. These verses explain how God made the world fit to become his kingdom. Many interpreters have pointed out that these six days exhibit a discernable pattern that displays God's wisdom and purposes in the way he formed his creation. In the first three days God dealt with the fact that the world was formless. In the second three days, he dealt with the fact that the world was empty. Moreover, God's actions in these two sets of three days parallel each other in some remarkable ways. In day one God formed the day and restricted the darkness to the night. And correspondingly, in day four he placed the sun, moon and stars in the sky to maintain this order. In day two God formed the atmosphere; separating the waters below from the waters above. Then in day five, God formed the birds to fill the space between the waters, and he formed the sea creatures to fill the waters below. On the third day God restrained the deep waters below by forming lush, fertile land. And on the sixth day, God created land animals and humanity to fill the land. God displayed unsurpassed wisdom and power as he spoke and transformed the world from chaos into a marvelously ordered place. Now, we should draw special attention to a repeated theme in verses 3-31. Specifically, Genesis 1 tells us that when God looked at his creation, he saw that it was good. And in verse 31, we see that on the sixth day he looked at his work and saw that it was very good. Now, when the Bible says that creation was good, it means, in part, that God approved of his work in a moral sense because he had significantly restrained the chaos, the darkness and the deep, and because he had brought order to the world. But the word translated "good," tov. in Hebrew, also means more than that. Here and in other places in the Old Testament, it also denotes "pleasant," "pleasing," and even "beautiful." In six days, God changed the world so that it reflected his own will and desires, making it a beautiful place that delighted him. This is why the third part of the creation account in 2:1-3 speaks of the Sabbath day as it does. In the beginning of Genesis 1 God had been dissatisfied with creation. But in Genesis 2:1-3 God took pleasure in what he had done. In fact, God was so pleased with the initial arrangement of the earth that he rested from this work and sanctified the seventh, or Sabbath day. In a word, God was satisfied that his initial preparations set the earth on a path to becoming the kind of place he wanted it to be. As we have seen, God initially prepared the earth as a place that pleased him, but we also need to notice that God's grand purposes for the earth required further development. Now the Lord God had planted a garden in the east, in Eden… And the Lord God made all kinds of trees grow out of the ground — trees that were pleasing to the eye and good for food. In the middle of the garden were the tree of life and the tree of the knowledge of good and evil (Genesis 2:8-9). Think about it this way. God handled the entire earth in the way artists often make pencil sketches on their canvases prior to painting. He did not immediately paint the entire canvas of the earth; he simply established a basic order and orientation for the way he wanted the world to be. But the painting was not complete. Even so, God did paint one portion of the earth with magnificent colors and adorned it as the center of his creation. The region of the earth was called Eden, which means in Hebrew "pleasant" or "pleasing," and that region was God's special delight. The centerpiece of Eden, in turn, was a garden, a wondrously beautiful place, a spectacular oasis, a magnificent paradise garden fit for a king. And so it was that although God was omnipresent in his creation, invisibly present everywhere, he chose the land of Eden, and especially the Garden of Eden within it, as the place of his special, visible presence. This was where God displayed himself gloriously on the earth. But this garden and this land were only a small portion of the earth. The rest of the world had been ordered to some degree, but it was still in need of much more. Now that we have seen how God first prepared the earth as the place for his rule, with Eden and his holy garden as its beautiful and delightful centerpiece, we should turn to our second topic in the primeval period: the people of God's kingdom. At this time, God ordained the human race as his kingdom servants, the instruments by which He would complete his preparations for the earth to become his kingdom. The Lord God said, "It is not good for the man to be alone. I will make a helper suitable for him" (Genesis 2:18). God, who had judged that the creation was "good," had found something in his special, holy Garden that was "not good" — Adam had no wife. But why was this not good? In a word, God had created the human race for a job that was too great for one creature to accomplish on his own. We can see why this task was too great for one man by noticing that humanity's role is described in two ways. God made Adam and Eve to serve him as priests and as his vice-regents or royal representatives. The Lord God took the man and put him in the Garden of Eden to work it and take care of it (Genesis 2:15). At first glance, we might think that God simply ordained Adam and Eve to be gardeners, but they were much more than this. In fact, the expression "to work it and to take care of it" is unusual and had special significance for Moses and the Israelites who first read this story. They are to take care of all the furnishings of the Tent of Meeting, fulfilling the obligations of the Israelites by doing the work of the tabernacle (Numbers 3:8). Adam and Eve's role in the garden is described in ways that reflect this technical description of the Levites' role in their priestly service to God. Adam and Eve were placed in God's holy garden, the place of the divine king's special presence on earth, much like the tabernacle was in Moses' day. And they performed priestly work in the worshipful service of the great king by beautifying and maintaining his holy garden. Adam and Eve served God as priests as they worked in his holy dwelling. [God] said, "Let us make man in our image, in our likeness, and let them rule over the fish of the sea and the birds of the air, over the livestock, over all the earth, and over all the creatures that move along the ground" (Genesis 1:26). Now we all know that this and other passages call human beings "the image or likeness of God." In the past, theologians commonly thought this meant that human beings are rational, moral creatures. But this is not the focus of Genesis 1. To understand the significance of being an image of God, it helps to know that in the ancient world of the Old Testament, it was common for kings and emperors within and around Israel to be called "images," "likenesses" and even "sons of the gods." Kings and emperors received these titles because in Old Testament times, people believed that royal figures had a very special role in the world that distinguished them from ordinary human beings. Kings were thought to stand between heaven and earth, and it was believed that kings and emperors had the special task of learning the will or wisdom of the gods in heaven, and then using their royal power to enforce that heavenly will on the earth. To use Jesus' language from the Lord's Prayer, kings were to learn the will of God in heaven and to bring that will to the earth. Now, we can see that Moses was radical in his day because he declared that all human beings — not just kings and emperors — were images of God. According to the Old Testament, all human beings were created to be God's vice-regents, to rule over the earth on God's behalf and to make sure his will is done here, much like ancient emperors were thought to rule on the behalf of their gods. So God created man in his own image, in the image of God he created him; male and female he created them. God blessed them and said to them, "Be fruitful and increase in number; fill the earth and subdue it. Rule over the fish of the sea and the birds of the air and over every living creature that moves on the ground" (Genesis 1:27-28). We can summarize this royal role for the image of God in this way. As we have seen, God established a measure of order and beauty in creation, and he put humanity in his wondrous, holy garden to serve him as priests. But God also called his royal image to multiply numerically and to fill not just the Garden of Eden but the entire earth. And he ordained them to have dominion not just over the Garden of Eden, but over the entire earth as well. The great king of heaven ordained humanity as the instrument for kingdom expansion. Human beings were to multiply, to spread out, and to turn the entire earth into God's garden in order that they might bring the will of God to the earth and serve him as priests throughout the world. Extending God's kingdom throughout the world was the very purpose for which God put human beings on the earth. Now that we have seen how God established a place and a people for his kingdom at the very beginning, we are in a position to sketch the progress of God's earthly kingdom during the primeval period. We will summarize Moses' record of this time in three ways. In the first place, we will speak of the cosmic treason that took place against the great king. Second, we will look at how the corruption of humanity increased to unimaginable levels, and led to severe judgment. But third, we will find that God revealed a long-term strategy for fulfilling his kingdom purposes on the earth despite humanity's failings. Let's look first at the treason that occurred on the earth. Instead of bringing God's will to the entire earth, Adam and Eve succumbed to the temptation of Satan and rebelled against their divine king by eating the forbidden fruit. As a result, instead of spreading the beauty of Eden to the ends of the earth, they were cast out of Eden and were doomed to live under a curse. I will greatly increase your pains in childbearing; with pain you will give birth to children (Genesis 3:16). Cursed is the ground because of you; through painful toil you will eat of it all the days of your life (Genesis 3:17). Instead of fulfilling their task as the image of God with relative ease and unending honor, humanity was forced to dwell in a hostile world, and to experience pain and futility in living as God's image. In the second place, during the primeval period humanity continued to pursue a path of corruption that eventually led to severe judgment from God. Before the human race fell into sin, bearing children would have produced more images who were faithful vice-regents and priests. But when Adam and Eve sinned, it was no longer true that all of their physical descendants would be faithful to God. In fact, by their fallen nature, none of them even could be faithful without God redeeming them from the power of sin. The Lord saw how great man's wickedness on the earth had become, and that every inclination of the thoughts of his heart was only evil all the time. The Lord was grieved that he had made man on the earth, and his heart was filled with pain. So the Lord said, "I will wipe mankind, whom I have created, from the face of the earth — men and animals, and creatures that move along the ground, and birds of the air — for I am grieved that I have made them" (Genesis 6:5-7). In the third place, however, the primeval history tells us that God designed a long-term strategy for extending his kingdom throughout the world. In effect, with the corruption of the human race, God determined to redeem a select group of human beings from the dominion of sin, and to build his kingdom through them. God showed saving mercy to these images so that they would serve his purposes. I will put enmity between you and the woman, and between your offspring and hers; he will crush your head, and you will strike his heel (Genesis 3:15). The God of peace will soon crush Satan under your feet (Romans 16:20). This hope of redemption continued from Adam and Eve's time all the way to our own day. In contrast with the line of Cain that became more and more corrupt, a third son, Seth was born to replace faithful Abel. As the genealogy of Genesis 5 tells us, Seth and his descendants honored God with their lives as they sought to bring his will to the earth. And even when things became so bad on earth that God destroyed humanity by a worldwide flood, there was one descendant of Seth who was faithful and found favor in God's eyes, Noah, and God rescued Noah and his family even as the flood exterminated the rest of humanity. Then God blessed Noah and his sons, saying to them, "Be fruitful and increase in number and fill the earth" (Genesis 9:1). In a word, God established stability in nature and removed the threat of a worldwide flood so that his redeemed images could fulfill humanity's original task. God knew what the rest of Scripture makes clear. The road to extending his kingdom would not be straight and uninterrupted. He knew his own people would stumble and fall, and he knew that the opposition to his kingdom servants would rise and fall. So he established a new order of long-term stability in nature, in order that one day in the distant future, his redeemed, faithful images could fulfill the job of spreading his kingdom throughout this fallen world. So it is that the historical kingdom of God began in Eden and was to be extended throughout the entire earth by God's priestly and royal images, the human race. Despite the complexities introduced by sin, God devised a long-term historical strategy to redeem some of his images so that they would be able to bring his kingdom to earth as it is in heaven. These basic contours of the primeval history set the course for the rest of biblical history. Now that we have seen how the kingdom of God began during the earliest years of earth's history, we are ready to move to the next major historical stage that covers the vast majority of the Old Testament, the time when God dealt especially with Israel as his chosen people. From the perspective of the Old Testament, the history of the ancient nation of Israel represented a major stride for the kingdom of God coming to earth as it is in heaven. To see how the kingdom of God developed in ancient Israel, we will look again at three topics: first, we will explore the place of the kingdom during this stage of history; second, we will look at the people of the kingdom; and third, we will examine the progress of the kingdom during this period. Let's look first, then, at the location of God's kingdom in the nation of Israel. Leave your country, your people and your father's household and go to the land I will show you. I will make you into a great nation and I will bless you; I will make your name great, and you will be a blessing. I will bless those who bless you, and whoever curses you I will curse; and all peoples on earth will be blessed through you (Genesis 12:1-3). Notice what God said in verse 1 — he called Abraham to leave his homeland in Mesopotamia and to migrate to a land Abraham had not yet seen. Now, as Genesis 12 progresses, we discover that God led Abraham from Ur in southern Mesopotamia to Haran in northern Mesopotamia, and later from Haran to the land of Canaan, which we now call the Holy Land. And when Abraham arrived in Canaan, God confirmed that Abraham's descendants would receive this particular geography as their homeland, and as the rest of the Old Testament makes clear, Abraham's promised land became the geographical center for God's activities in the world from this time forward. Abraham's call to the Promised Land helps us understand the place of God's kingdom in at least two ways: first, we will see that God called Abraham and Israel to serve him at the original center of his kingdom; second, we will see that God called Israel to extend his kingdom beyond that original center. Let's look first at the idea that God called Abraham and his descendants to serve him at the original centerpiece of his kingdom. As we have seen, the original center of God's earthly kingdom was Eden. Unfortunately, many interpreters have wrongly believed that Eden was in Mesopotamia. So, they also mistakenly believe that Abraham actually left the vicinity of the Garden of Eden in order to move to Canaan. But Scripture draws a very close connection between Abraham's Promised Land and the land of Eden. A river watering the garden flowed from Eden; from there it was separated into four headwaters. The name of the first is the Pishon; it winds through the entire land of Havilah… The name of the second river is the Gihon; it winds through the entire land of Cush. The name of the third river is the Tigris… and the fourth river is the Euphrates (Genesis 2:10-14). Four rivers formed the boundaries of Eden: the Pishon and Gihon, which are associated with the lands to the southwest in the area of Northeastern Egypt, and the Tigris and Euphrates to the northeast of Canaan. To your descendants I give this land, from the river of Egypt to the great river, the Euphrates (Genesis 15:18). Now, most interpreters agree that the "river of Egypt" is not the Nile, but one of the smaller rivers in Northeastern Egypt. But whatever the case, we can see that God promised Abraham land that was bordered by the Euphrates in the northeast and Egypt in the southwest, and as we have seen, the Promised Land's geographical boundaries reflect the boundaries of Eden. Although some questions remain about how closely we should associate Canaan with Eden, it is at least clear that when God called Abraham to Canaan, he called him back to the area where Adam and Eve first served God. So, just as Eden had been established in the very beginning as the centerpiece of God's presence on earth, after the failures of the primeval history, God called his special servant Abraham back to the geographical center to begin rebuilding the kingdom. A second implication of the connection between the Promised Land and Eden is that God gave this land to Old Testament Israel not as an end in itself, but as a staging ground for extending his reign to the ends of the earth. I will bless those who bless you, and whoever curses you I will curse; and all peoples on earth will be blessed through you (Genesis 12:3). Through a process of blessing and cursing nations in response to their reaction to Abraham and his descendants, all peoples on the earth would eventually be blessed. This promise does not simply refer to how Abraham's faith — and now the Christian faith — would spread to different tribes and language groups, although this is one aspect of the promise. This verse also refers to geography. Abraham's blessing would reach all families throughout the earth. Abraham and his offspring received the promise that he would be heir of the world (Romans 4:13). Abraham was not just promised a small piece of land as his inheritance; he was promised the world. Canaan was merely a down payment on this full inheritance — the entire world. The expansion of the kingdom of God beyond the original borders of the Promised Land took place in small scale at different times in the Old Testament. In the days of Moses and following, two and a half tribes occupied lands east of the Jordan. And during the reigns of various kings, Israel's borders expanded northward, eastward and southward. So it is that during the time of Old Testament Israel, the center of the kingdom of God was the land of Canaan, but even then the kingdom of God was beginning to spread to all the earth. With the location of the kingdom in the days of Old Testament Israel in mind, we should turn our attention to the people of the kingdom. The history of God's people during this time is very complex, so we will have to limit ourselves to a few highlights. Nevertheless, we will still be able to see the big picture of Israel's role in the kingdom of God, and how it aligns with God's original purposes for humanity. We will look at three matters: first, the selection of Israel as a special people for the kingdom; second, the formation of those people into a kingdom of priests; and third, the designation of official priests and kings to lead the people of the kingdom. In the first place, let's consider the selection of Israel as the special people of God. We should remember that during the primeval history, with the introduction of sin into the world, God chose one family out of the entire human race that was to serve as his special images in the world. We see the pattern of a single special family first in Genesis 5, where Adam's son Seth became the father of a righteous line of humanity. Later, God maintained Seth's family through his descendant Noah. You will also recall that Noah had three sons: Shem, Ham and Japheth, but only Shem was God's specially chosen image or son. Out of Shem's descendants, one man was chosen to carry on this special role, Abraham. Then Abraham's miracle son Isaac continued this chosen line. And then Isaac's son Jacob, also known as Israel, became God's specially honored image. And finally, Jacob had twelve sons, Joseph and his brothers, and these twelve sons became the fathers of the twelve tribes of the nation of Israel. These twelve tribes were dearly loved by God and given the special title of being the people of God, the ones whom God loved as his firstborn. Out of all the nations of humanity, the tribes of Israel were the special people of God's kingdom. Notice what God said about the twelve tribes of Israel. Israel was to be "a kingdom of priests… a holy nation." As we have seen, they were to be "holy," that is, special, separated, distinguished from all other peoples. But more precisely, they were to be a "kingdom of priests," or a priestly kingdom. This designation of Israel as a kingdom of priests shows that Israel continued to fulfill the twofold role that Adam and Eve had in the very beginning. You will recall that Adam and Eve were called to serve as God's royal priests. Here we see that the tribes of Israel were also called to be God's imperial priests. In the third place, although Israel as a whole had the privilege of being a royal priesthood for God's kingdom, we should also note that as they grew into a strong nation, some Israelites were given the specialized office of priest and king. In a general sense the entire nation of Israel was made holy as God's special kingdom of priests. But God eventually selected certain people and families within Israel to be his very special images by serving in the offices of priest and king, which led the nation in their holy service to God. As the book of Exodus tells us, Aaron and his descendants were to serve God as his priests. They primarily led the nation into the special presence of God in the Tabernacle and Temple, offering worship, sacrifice, and praise, and later, David and his descendants were ordained to serve as kings of God's people. They served as God's special servants in the more political dimensions of the nation. Now that we have seen the place and people of the kingdom in Old Testament Israel, we should take a few moments to sketch out the progress of the kingdom during this time. Sadly, the history of Israel is much like the primeval period. It is a mixture of very positive accomplishments and abysmal failures. The kingdom of God made advances, but because of human sinfulness, these advances fell short of the ultimate goal; they did not spread God's kingdom to the ends of the earth. This period of biblical history is lengthy and complex, so we can only touch on some highlights. We will speak of three stages in the progress of the kingdom during this period: first, the stage of promise; second, the exodus and conquest; and third, the period of Israel as an empire. "Look up at the heavens and count the stars, if indeed you can count them." Then he said to him, "So shall your offspring be" (Genesis 15:5). As we have seen, Abraham and his descendants were chosen to lead humanity in carrying out its role as the images of God. This was to happen, in part, through the multiplication of a holy seed, so that redeemed human beings would be as innumerable as the stars. This is why so much stress is put on the birth of Isaac, Abraham's miracle child through Sarah. It is also why the biblical story focuses so much on Isaac's son Jacob and on Jacob's twelve sons. The people of God were multiplying already in the Old Testament, even in this early period of promise. And this is why the multiplication of redeemed images of God in the nation of Israel is a central theme throughout the Old Testament. And [God] said to him, "I am the Lord who brought you out of Ur of the Chaldeans, to give you this land to possess it" (Genesis 15:7). Just as God instructed Adam and Eve to dominate the earth, he promised that his special people Israel would have dominion and enjoy prosperity in the land of promise. This is why Abraham purchased a small symbolic piece of land in Canaan as a burial site for his family. Further, it explains why Jacob left the land of promise for a while, but returned even in the face of much danger. And it also explains why, in his dying words, Joseph assured the Israelites that they would leave Egypt and return to the Promised Land. The patriarchal period was a time when God promised that he would multiply and give dominion to Old Testament Israel as the people who would further his kingdom. In your unfailing love you will lead the people you have redeemed. In your strength you will guide them to your holy dwelling (Exodus 15:13). Notice that the Israelites praised God because he was guiding them toward his holy dwelling. As we have seen, just like Eden, the promised land was to be the center of God's special holy presence on the earth. But more than this, we should note that the term translated "lead," nahal in Hebrew, is associated with leading sheep. This type of shepherding imagery commonly described the activities of kings both in the Ancient Near East in general, and in the Bible. God was leading his people toward his holy dwelling as their Shepherding King. You will bring them in and plant them on the mountain of your inheritance — the place, O Lord, you made for your dwelling, the sanctuary, O Lord, your hands established. The Lord will reign for ever and ever (Exodus 15:17-18). According to these verses, God was taking Israel toward a holy mountain, a sanctuary which the Bible later reveals to be Jerusalem. And what was to be the nature of that mountain sanctuary? First, Moses said it would be God's "dwelling." Once again, the term translated "dwelling," in Hebrew yashav, often connotes "a king's enthronement." In light of the royal motifs in this passage, it is best to understand that the sanctuary mountain will be the place of God's enthronement. The Lord will reign for ever and ever (Exodus 15:18). When God acted as Israel's king by shepherding the nation to the Promised Land, he intended to establish them as the people who would surround his royal throne. In other words, the purpose of the exodus and conquest was to establish God's reign, his kingship, his kingdom on earth, forever and ever. The third stage of the kingdom of God during the period of Old Testament Israel's importance may be designated as the stage of the empire, the time when Israel became an established nation with a king and temple. Unfortunately, the place of human kings in God's plan for Israel is a matter of some controversy. In a later lesson we will look carefully at the fact that God had always wanted Israel to have a human king, and at how kingship developed in Israel. But for now we will simply see how the kingdom of God moved forward once God had determined to establish David and his sons as kings over his people. Solomon sat on the throne of the Lord as king in place of his father David (1 Chronicles 29:23). The throne of David was the throne of the Lord. The royal house of David led the people of Israel by representing the royal authority of God; David and his sons had a heightened official role as the exalted images of God leading other images of God. I had it in my heart to build a house as a place of rest for the Ark of the Covenant of the Lord, for the footstool of our God, and I made plans to build it (1 Chronicles 28:2). God's throne was in heaven, but the footstool of his throne was the Ark of the Covenant in the temple in Jerusalem. In effect, Solomon turned Jerusalem into a capital city for the family of David, and a royal sanctuary for God himself. So we see that by the time of David and Solomon, Israel had gone from being a migrating tribe in the days of Abraham to being a nation established through exodus and conquest, and finally to becoming an empire with a king and a temple in the imperial city of Jerusalem. God's kingdom was being established in the nation of Israel. Endow the king with your justice, O God, the royal son with your righteousness… He will rule from sea to sea and from the River to the ends of the earth… All kings will bow down to him and all nations will serve him… May his name endure forever; may it continue as long as the sun. All nations will be blessed through him, and they will call him blessed (Psalm 72:1, 8, 11, 17). We can see several important themes here. First, the Psalmist prayed for a blessing on David's house, that David's dynasty would be characterized by justice and righteousness. But he knew that this would result in a great expansion of David's reign. The house of David would reign over the whole earth. He would reign from sea to sea, and all kings and all nations would serve the one on David's throne who represented God's righteousness and justice. The reign of God's special servant, the king of Israel, would extend the reign of God to all the nations of the earth. All peoples on earth … be blessed through [Abraham] (Genesis 12:3). But how was this promise to Abraham to be fulfilled? All nations will be blessed through him, and they will call him blessed (Psalm 72:17). The allusion to Genesis 12:3 is obvious. God's original goal in choosing Abraham would finally be fulfilled when the house of David spread God's blessing to all nations. Praise be to [God's] glorious name forever; may the whole earth be filled with his glory. Amen and Amen (Psalm 72:19). This closing verse of Psalm 72 reveals the ultimate goal for all of the developments that took place in Israel from the patriarchs' promises, through the exodus and conquest, and to the empire. These stages of the kingdom were all intended to fill the entire earth with the glory of God. As God's kingdom spread from the borders of Israel to the ends of the earth through the reign of David's house, God's glorious presence would fill the whole world, just as it fills heaven. Now that we have seen the background of the kingdom of God during the primeval history and the history of Old Testament Israel, we should turn to our last topic: the kingdom of God in the New Testament. As followers of Christ we must understand the New Testament perspectives on the kingdom of God if we are to apply the Old Testament rightly in our day. Jesus went throughout Galilee, teaching in their synagogues, preaching the good news (or gospel) of the kingdom (Matthew 4:23). Jesus preached gospel, or good news. But what was this good news? It was a message about the kingdom of God. And for this reason, our understanding of the gospel that we believe and share with others, the very heart of the New Testament, is directly dependent upon our understanding of the kingdom of God. We will explore the theme of God's kingdom in the New Testament in terms of the three issues we have explored in other stages of biblical history. We will look first at what the New Testament says about the place of the kingdom; second, we will speak about the people of the kingdom; and third, we will look into the progress of the kingdom during the New Testament period. Let's look first at the place of the kingdom in the New Testament. In many respects the New Testament has the same orientation toward the location of the kingdom of God as we find in the Old Testament. First, it indicates that the center of God's kingdom was the land of Israel, and second it teaches that the kingdom of God was to expand throughout the earth. Let's look first at the kingdom's location in Israel during the days of the New Testament. Now it should not surprise us to find that the kingdom of God in the New Testament is centered in Israel. This is the pattern that we have seen repeated several times in the Old Testament. In the beginning God's kingdom on the earth was centered in Eden. Then, the nation of Israel returned to Eden's vicinity under Moses' leadership in order to build the kingdom of God. So, when the New Testament stage of God's kingdom began, the kingdom started once again in the land of Israel. It really isn't difficult to see that the land of Israel is the geographical center of the kingdom of God in the New Testament. As we all know, Israel was where Jesus was born, where he grew up, gathered his apostles, ministered, died, was resurrected, and ascended into heaven. Apart from a brief time in Egypt during his childhood, Jesus spent his entire life in the Promised Land. Now to understand why God's kingdom was centered in the Promised Land even in the New Testament, it helps to remember the situation of the people of God at this time. God had blessed the nation of Israel in the Old Testament. He had brought them through a semi-nomadic existence during the days of the patriarchs, to nationhood under Moses and Joshua, and then to imperial glory with a capital city, a palace and a temple under the leadership of David and Solomon. These were great advances for the reign of God on earth. But as the Old Testament tells us, the Israelites rebelled so severely against God during these times of blessing that God exiled his people from the holy land. By the time of Jesus, the people of Israel had been exiled, scattered, and tyrannized by five pagan empires for hundreds of years: the Assyrians, the Babylonians, the Medes and Persians, the Greeks, and the Romans. The scroll of the prophet Isaiah was handed to him. Unrolling it, he found the place where it is written: "The Spirit of the Lord is on me, because he has anointed me to preach good news to the poor. He has sent me to proclaim freedom for the prisoners and recovery of sight for the blind, to release the oppressed, to proclaim the year of the Lord's favor" (Luke 4:17-19). Then [Jesus] rolled up the scroll, gave it back to the attendant and sat down. The eyes of everyone in the synagogue were fastened on him, and he began by saying to them, "Today this scripture is fulfilled in your hearing" (Luke 4:20-21). Jesus was the one whom God anointed to declare to the Israelites the good news that their exile was coming to an end. Now as important as it is to see that the kingdom of God in the New Testament is centered around the Promised Land, it is just as important to see that the New Testament stresses the expansion of the kingdom of God to the entire world. In fact, the New Testament teaches that one day the hope of worldwide expansion will actually be fulfilled in Christ. Just as in every prior stage of history, in the New Testament God still planned to expand his kingdom from the Promised Land to the entire earth. Your kingdom come, your will be done on earth as it is in heaven (Matthew 6:10). This gospel of the kingdom will be preached in the whole world as a testimony to all nations, and then the end will come (Matthew 24:14). The message of the good news of the arrival of God's kingdom was to be spread throughout the world and then Jesus would return. With the place of the kingdom in the New Testament in mind, we should turn our attention to the people of the kingdom in the New Testament. As we have seen, in the beginning God ordained that his worldwide kingdom would mirror his kingdom in heaven. This was to take place through the work of his image, the human race. But with the advent of sin, humanity could no longer fulfill its role. Therefore, God chose a special people and redeemed them from sin so they would be able to continue his work. These special people eventually became the nation of Israel. And as Old Testament history moved forward, God exalted special people within Israel, the priests and kings, to lead his redeemed nation in their kingdom tasks. These same issues also appear in the New Testament. To grasp the way in which the New Testament speaks of these things, we will touch on two subjects: first, Christ as the premiere image of God; and second, believers in Christ as redeemed images of God. Let's consider first the prominent place given to Jesus as the image of God. It is sad, but it's true, that evangelical Christians today often have little idea why the second person of the Trinity, the eternal Logos, became flesh. We rightly affirm that Jesus is God, and we talk a lot about his substitutionary death on the cross and his resurrection from the dead. But modern Christians seldom understand why Jesus had to become a man in order to do these things. Well, one of the best ways to understand why God became one of us is to look at the role of humanity in the kingdom of God, and the way Jesus fulfilled that role. Two aspects of this role in particular deserve our attention: first, the fact that Jesus is the last Adam; and second, the fact that Jesus is our priest and king. For since death came through a man, the resurrection of the dead comes also through a man. For as in Adam all die, so in Christ all will be made alive (1 Corinthians 15:21-22). Notice how these words contrast with what we might expect. We might have expected Paul to say something like this, "Death came through a man, but the resurrection of the dead comes through the power of God." Now, this would be true as far as it goes, but it is not what Paul stressed here. Instead, he said that because humanity's death came through a man, namely Adam, humanity's resurrection from the dead to eternal life also had to come through a man, namely Christ. Adam was an unfaithful image of God, and therefore he brought us death; but Christ was the perfectly faithful image of God, and therefore he brought us resurrection life. Christ died under the curse of Adam's sin as a substitute for all who would believe in him, and therefore he received God's reward for his righteousness — and this reward included both victory over death, and dominion over the whole creation. This is one reason the New Testament focuses so much on the humanity of Christ. He is the last Adam, the man who did everything the human race was supposed to do from the beginning. Through his efforts God's kingdom purposes will be fulfilled. We have a great high priest who has gone through the heavens, Jesus the Son of God (Hebrews 4:14). He will be great and will be called the Son of the Most High. The Lord God will give him the throne of his father David, and he will reign over the house of Jacob forever; his kingdom will never end (Luke 1:32-33). Because Christ perfectly fulfills the office of king, under his leadership the kingdom of God will never end. Through Christ's leadership as priest and king, God's kingdom will indeed come to earth as it is in heaven. Although Christ is without question the most important person in the kingdom of God during the New Testament age, we would be mistaken if we did not add that his followers are also part of the kingdom. Now, at the very beginning of the New Testament, the Jewish people, Abraham's physical descendants, had a special role in the kingdom. Not only were Jesus and his apostles Jews, but so was the entire early church that gathered on the day of Pentecost. On that day, God collected a faithful remnant of Israelites from all over the world to hear and believe in the gospel. [We are] to put on the new self, created to be like God in true righteousness and holiness (Ephesians 4:24). But you are a chosen people, a royal priesthood, a holy nation, a people belonging to God, that you may declare the praises of him who called you out of darkness into his wonderful light (1 Peter 2:9). Here Peter alluded to Exodus 19:6 where Israel was called a kingdom of priests. By this allusion, he makes it clear that Christians from every race on earth are called to share the goal of Old Testament Israel — the establishment and the extension of God's kingdom on earth. As we follow Christ and live in the power of his Spirit, we are all the special, chosen instruments of the kingdom of God. Now that we have seen both the place and the people of the kingdom in the New Testament age, we should turn to our last topic: the progress of the kingdom in the New Testament. In many ways, the progress of the kingdom of God in the New Testament is one of the most radical concepts that we find in the Scriptures. As we will see in later lessons, when we read the prophets of the Old Testament, it is easy to get the impression that once the Christ came to earth, the kingdom of God would come swiftly. Evil would be eradicated suddenly from the earth, the earth would be filled with the glorious presence of God, and God's countless people would fill the earth, serving and worshiping him forever. In fact, this is what most people in Jesus' day expected to happen. But Jesus challenged this expectation so strongly that most people in Israel rejected him rather than followed him as their Messiah. The kingdom of heaven is like a mustard seed, which a man took and planted in his field. Though it is the smallest of all your seeds, yet when it grows, it is the largest of garden plants and becomes a tree (Matthew 13:31-32). In this short parable, Jesus explained that instead of coming suddenly and catastrophically, the kingdom of God would begin small, like a mustard seed; but in time the kingdom would grow to be like a mature mustard tree, the largest kingdom the world has ever known. As the rest of the New Testament tells us, the New Testament phase of the kingdom began with Jesus' earthly ministry in a relatively small and quiet way. But in the end, when Christ returns, his kingdom will extend over the entire earth. Throughout this series of lessons, we will speak time and again of the progress of God's kingdom in the New Testament age in three main stages. … built on the foundation of the apostles and prophets, with Christ Jesus himself as the chief cornerstone (Ephesians 2:20). Seek first his kingdom and his righteousness (Matthew 6:33). Every day of our lives we are to spread the gospel, build the church, and transform cultures throughout the world for the sake of Christ's kingdom. In the third place, we will speak of the consummation of the kingdom, the time when Christ returns and fulfills God's plan to turn the whole world into his kingdom. The seventh angel sounded his trumpet, and there were loud voices in heaven, which said: "The kingdom of the world has become the kingdom of our Lord and of his Christ, and he will reign for ever and ever" (Revelation 11:15). When Christ returns to the earth, the entire kingdom of the world will become the kingdom of God and of Christ forever and ever. As followers of Christ living today, we look back to our Lord's inaugural work 2000 years ago. We extend his kingdom today during the continuation of the kingdom, and we pray, work, and hope for the day when Christ will bring the kingdom of God to earth as it is in heaven. This is the heart of our Christian faith even as it was the heart of Old Testament faith. All the hopes of the kingdom of God in the Old Testament find their fulfillment in Christ during these three phases of the inauguration, continuation and consummation of the kingdom of God. In this lesson we have introduced the important biblical theme of the kingdom of God as one of the best ways to grasp the big picture of the Old Testament. We have seen that God planned from the very beginning for his heavenly reign to come to the earth. We have seen how God moved toward this goal in the primeval history, in Israel's history, and in the New Testament age. As we continue our survey of the Old Testament, we will return to this kingdom theme time and again because it is the most comprehensive and unifying theme in the whole Old Testament. And as we do, it will give us as New Testament believers the opportunity to approach the Old Testament as our guide for living for the king and his kingdom even today.